Preliminary CPU temperature tests using AC MX-2 thermal compound showed that Idle temperature is about 38°С whereas under the LinX load temperature does not got higher than 72°С. Not bad, a very promising start. Just 3°С higher compared to results with thermal compound only. However, I could not make a screenshot of Linpack test pass. The temperature sharply increased and went over 100° in seconds which triggered CPU overheating function followed by an emergency PC shut down. One side of the pads is pink, has dry hard surface with a structure of gauze. At first, it seems that this is a protective layer and should be removed, but it is not. Only one layer of T-pad has such color. Pink side of the t-pad has no additional protective layers. This is a part of a T-pad itself so when trying to separate it — it breaks and crumbles. The other side — white, sticky and humid. In stock cooling systems white side touches the rad while pink faces the memory chips. I had a bad feeling about these pads. Later I realized that my feeling were right. I launched the system, entered BIOS setup and went strait to monitoring section and… saw CPU temperature reaching 95 ° C, 5 seconds after it, the computer shut down. I checked the pressing, turned the pads on the other side — now the pink side was facing the processor. I started the system and got similar results. Test failed. Therefore, no LinX tests using this pads were made, since almost immediately after turning on the system CPU overheating functions was triggered. Structure, outlook and composition of Phobya T-pads is same no mater what thickness they have. The only difference in the size of pads. Color — grey, are quite sticky and wet. These pads can be sag down tangibly enough with a strong clip — this was tested separately and has no attitude toward testing results. 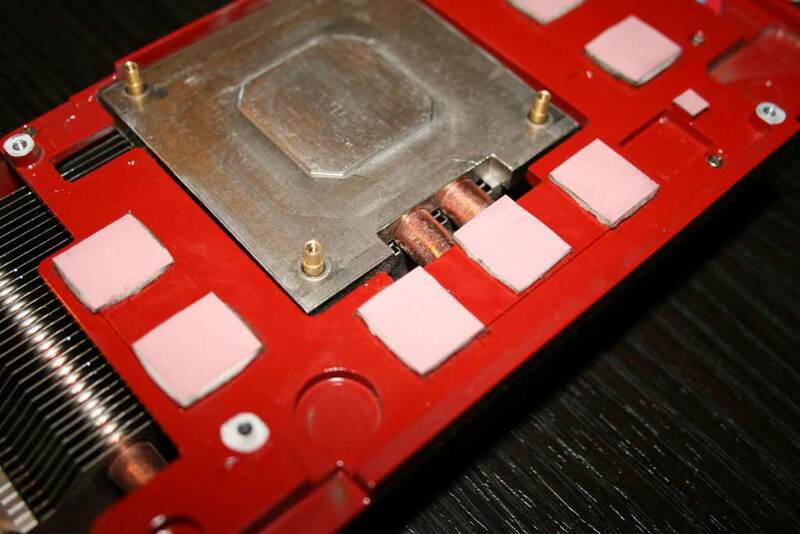 The CPU cooler has not enough pressure to squeeze this pad as it is done when pads are installed between fullcover and board ICs. Phobya 0.5 mm thick t-pads showed absolutely the same temperatures as Koolance 0.5 mm in a Idle mode. There was odd results when I ran LinX using this pad. The first iteration was passed successfully. Then temperature went over 100°С very quickly and the testing was stopped. If compared to Phobya 0.5 thick pads the temperature increased by 7°С. Nonetheless, I could not make a screenshot of Linpack test pass. A quick abrupt increase in temperature (I saw peak value 122°С) led to a BSOD.